If you’re looking to start your career or are thinking about getting a new job, consider looking for work in a boomtown. You’ll need to be geographically flexible, of course, but if you are, you can take advantage of the better employment odds in a boomtown — a growing town that’s thriving economically. The folks at SmartAsset.com recently released their list of the 10 top boomtowns of the past year. Here’s a look at them, and how you might land a job in one of them. Why those five metrics matter is clear: You want a low unemployment rate so that it’s more of a job-hunter’s market than a job-filler’s one. It’s also better for the unemployment rate to be falling than rising. An increasing number of homes will help keep housing more affordable, and a growing population tends to reflect people moving into an area. (Note that the population growth rate assessed here is a net one, subtracting those who left an area from those who came to it.) Finally, GDP measures the value of goods and services produced in the region, so GDP growth reflects increasing productivity — a promising sign for job seekers. I didn’t include each city’s 2016-2017 change in unemployment or its GDP growth. 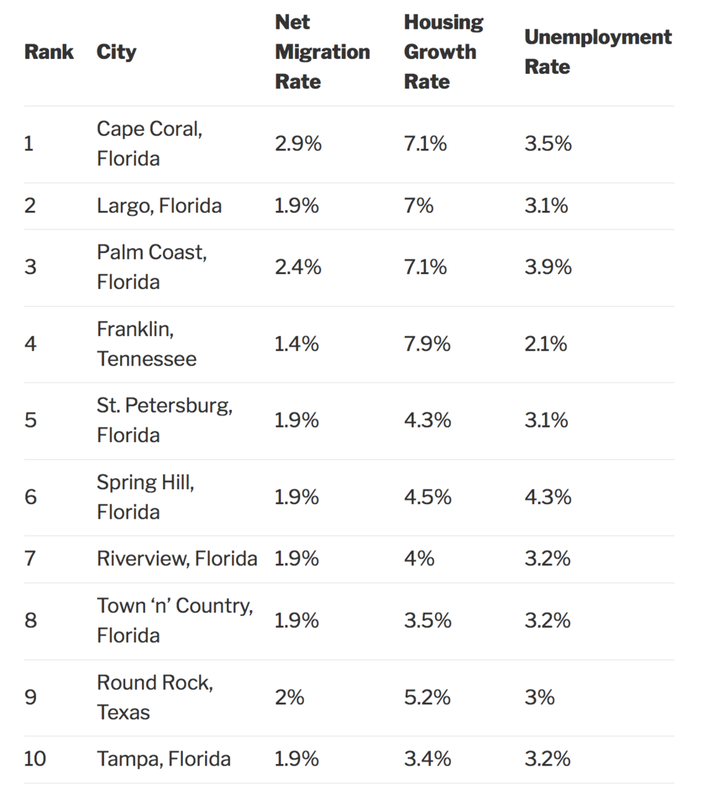 Unemployment fell over the year in all 10 towns and GDP growth was close to 4.2% for most, with Cape Coral posting the strongest growth, at 5.2%, and Franklin posting the slowest growth, at a still-respectable rate of 3.4%. One factor that might affect Florida boomtowns in the coming year is a big influx of people moving there from Puerto Rico, following the island’s devastating hurricane and slow recovery from it. Many more people could push housing prices and unemployment rates higher to some degree. Between early October and late December of 2017, more than a 250,000 people had arrived in Florida from Puerto Rico. Research each region of interest to see what companies are there that might be a good fit for you as an employee. Then check out their websites to see what job listings they have. Studying job listings can give you a sense of how actively a company is growing and how it’s growing, as you see what kinds of positions it’s filling. Consider other boomtowns Opens a New Window.. These 10 are not the only ones, and some of them probably won’t make next year’s list, while some newcomers will. Look into regions of interest and into growing industries of interest, to see which companies are hiring. Polish your resume, eliminating amateurish touches such as frilly fonts and phrases such as “references available upon request.” Highlight your achievements and use specifics, such as by saying that you increased sales by 18% in one year. Know that many employers use automation to sift through resumes, so be sure to include keywords from the description of the job you hope to land in your resume, as it can make you seem like a good match. It’s a good idea to look for jobs in boomtowns, but don’t rule out slower-growing areas, either, as great job opportunities exist in most places.